It’s one of those pop-culture artifacts too bizarre to be fabricated: a 1987 album of folk standards performed by senator and current presidential candidate Bernie Sanders, back when he was the mayor of Burlington, Vermont. 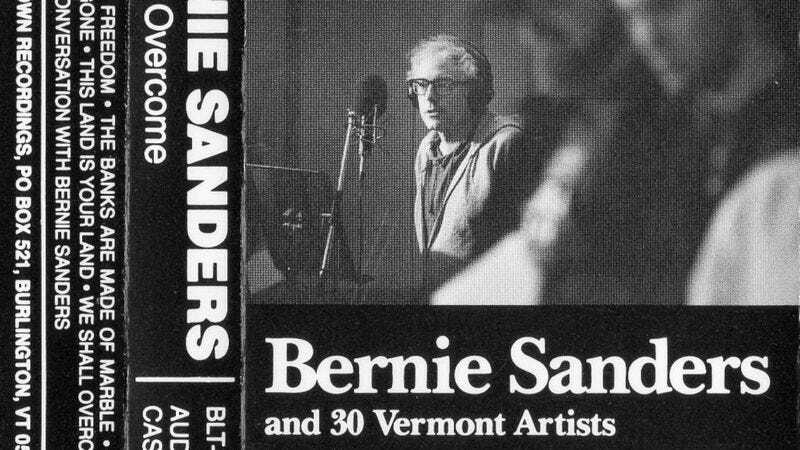 Credited to “Bernie Sanders And 30 Vermont Artists” and originally released only on cassette in a limited run of 1,000 copies, We Shall Overcome features earnest renditions of such standards as “This Land Is Your Land,” with the politician reciting the lyrics in his thick Brooklyn accent, accompanied by a bevy of local musicians and even a choir. Over at his Atavist blog, James Napoli has compiled an affectionate and informative history of how the strange album came into being, soliciting numerous quotes from the singers and musicians who took part in the newly relevant recording. This is still a really relevant project, maybe even more relevant to the times that we’re in now. And it illustrates that Bernie’s attitude on the issues that interest him has not changed one degree after all these years.